The Unicorn (Equus cornu "horse with horn") is a monster of fable and myth. Or rather they would be, were we not in a world where Gods and Goddesses divinely rein over Heros and Heroines. In such a world, Unicorns have been allowed to thrive. Unicorns are spectacular and noteable animals. They are like horses, save for the fact that they have an intricately designed spike protruding from the center of their forehead. This spike is thought to be the source of their magical powers. They are usually pure white of color, vain of spirit, and innocent of nature. It is their vanity that tends to lead them into most of their squabbles. They take pride in their beauty, using it to captivate and hypnotize onlookers. They then get these people to perform petty services for the unicorn. They are incredibly powerful though so woe betide any who dare to defy them. Unicorns have been accused of murdering young Sun Dogs in order to add that shine to their already silken shimmering pelt. The unicorns who commit such an attrocity lose their innocence. 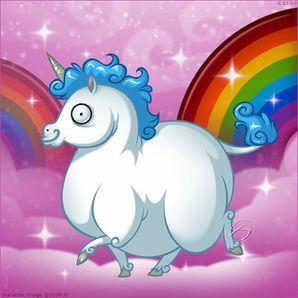 Unicorns who do not retain their innocence are scorned by the rest of the unicorn community and are far less valuable.